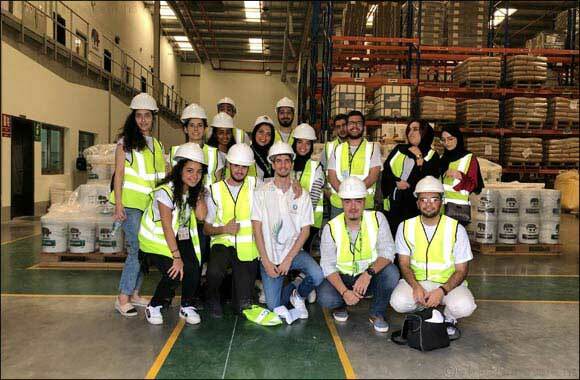 Dubai, September 05, 2018: Caparol Paints, a global provider of German paint and coating solutions, provided professional training to a group of 15 Architects and Interiors stream students of Ajman University in infrastructure painting system as part of the Solar Decathlon Middle East (SDME) competition. The team of 15 students under the name “Team Aqua Green” received training lessons from experts at Caparol in innovative painting systems using Caparol’s latest range of products. They were also taught the practical lessons on how to paint their houses by themselves. Brand experts also provided information on sustainability and sustainable paints. The SDME was created through an agreement signed between Dubai Electricity and Water Authority (DEWA) and the Department of Energy of the USA, in June 2015, to organize a sustainable solar houses competition in Dubai this year. It is an international competition where students from universities are requested to design and build a solar sustainable zero CO2 emissions house. They are then expected to dismantle the house and move it to the location of the exhibition in Dubai this year. The global competition witnesses 18 teams from 13 countries and 32 universities competing across 10 contests. “Caparol Paints offers a comprehensive product range, attention to detail, years of tradition and sustainability that determine its core values. The development of every single product at Caparol adopts years of tradition and values. The products are developed by Caparol’s technical experts based on extensive research into everything consumers want,” he added. Caparol Paints leads innovation with a highly sophisticated research and development department that constantly initiates technologies and manufacturing techniques complementing the local market conditions. Caparol Paints has registered a strong growth in the Middle East. Through its wide range of products, Caparol brings German paint technology while focusing on brining the best appealing colours and paint textures. The brand has also made headway in sustainability by paying attention to quality and the aspects for balancing economic, environmental and quality of life.